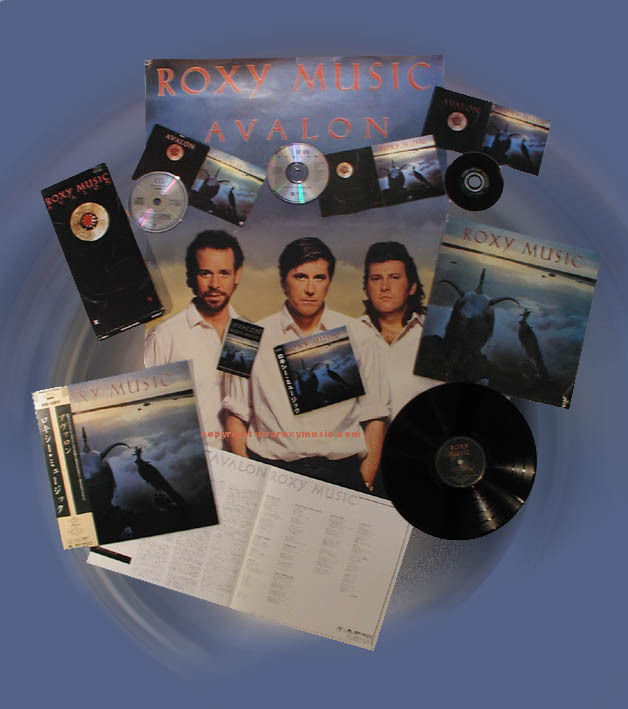 Avalon released 28th May 1982 is the eighth studio album by Roxy Music which proved to be their final album together was a huge commercial success reaching number 1 in the UK album charts and their most successful album in USA. Despite tensions within the band during the recording of this album, Bryan Phil and Andy, along with producer Rhett Davies produced one of the most accomplished albums of its time. An augmented band of 13 musicians took the Roxy sound further away from the initial impact created by Roxy in 1972 but still maintaining originality and creating a new benchmark for the future. A chance meeting with singer Yanick Etienne in the studio corridors led to the evocotive vocal weaving through the sax and guitar at the final refrain of the title track. The first single More Than This reached number 6, Avalon number 13 and Take A Chance With Me number 26 in the UK singles chart. The album cover features Lucy Ferry as the cover girl. The photograph was shot in Ireland on a lake at the home of Lucy Ferry's parents. Rhett Davis took the master tapes in 2002 to completely re-mix the album for a new version of the album to be released on 7th July 2003. This new version incorporating 5.1 surround sound also includes a new booklet with additional liner notes and previously unseen photos from 1982. The new version includes a re-mix of 'Always Unknowing' the b-side to the Avalon single. Avalon (Single Version) The single version of Avalon had a slightly different mix to the album. Always Unknowing This Roxy Music song written by Bryan Ferry was used as the b-side to the Avalon single. Take A Chance With Me (Single Version) The single version was had a different mix to the album. Take A Chance With Me (USA Single Version) The USA single had a shorter edited version compared to the album version. The Main Thing An extended version of the Main Thing was on the 'Take A Chance With Me 12" single. Bryan Ferry Keyboards And Vocals On "More Than This",Keyboards And Vocals On "Space Between", Keyboards And Vocals On "Avalon", Guitar Synthesizer And Keyboards On "India", Keyboards And Vocals On "While My Heart Is Still Beating", Keyboards And Vocals On "The Main Thing", Keyboards And Vocals On "Take A Chance With Me", Keyboards And Vocals On "To Turn You On", Keyboards And Vocals On "True To Life", Keyboards On "Tara"
Phil Manzanera Guitar On "More Than This", "Space Between", "Avalon", "India", "While My Heart Is Still Beating", "The Main Thing", "Take A Chance With Me", "True To Life"
Andy Mackay Saxophone On "More Than This", "Space Between", "Avalon", "India", "While My Heart Is Still Beating", "The Main Thing", "Take A Chance With Me", "True To Life", "Tara"
Alan Spenner Bass On "More Than This", "Avalon", "India", "To Turn You On", "True To Life", "Tara"
Andy Newmark Drums On "More Than This", "Space Between", "Avalon", "India", "While My Heart Is Still Beating", "The Main Thing", "Take A Chance With Me", "To Turn You On", "True To Life"
Neil Jason Bass On "Space Between", "While My Heart Is Still Beating", "The Main Thing", "Take A Chance With Me"
Fonzi Thornton Background Vocals On "More Than This", "Space Between", "Avalon", "The Main Thing", "Take A Chance With Me", "True To Life"
Yanick Etienne Background Vocals On "Avalon"
Rick Marotta Drums On "To Turn You On"
Paul Carrack Piano On "To Turn You On"
Kermit Moore Cello On "To Turn You On"